Dandelion seeds can float for several miles, and often land in someone’s lawn where they burst into hundreds. Named for their leaf shape after the French for “lion’s tooth”, dandelions are pests and can out-compete native plants in natural settings, and vehemently hated by many gardeners. Dandelion is one of the first flowers of spring, and the last flowers of autumn, which is good news for bees. All parts of the plant will emit a milky sap when broken. But the delicious news is that all parts of this plant are edible too! The most common use is of young leaves in a variety of lovely green dishes. But dandelions make an exquisite golden jelly too! Older leaves can be used too – simply blanch them to remove some of the bitter flavor, and sauté. Dandelions are also drinkable. 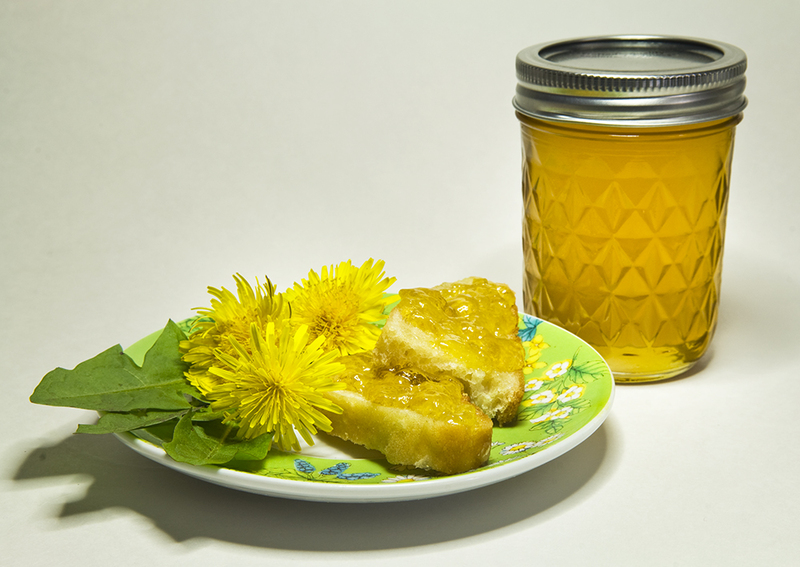 The roots can be used to make root beer and tea, and the flowers are used in dandelion wine (what a great way to prevent the plants from going to seed!). Dandelions are high in nutrition, filled with vitamins A, C, K and B complex. They are used in herbal medicine, especially as a tonic for the liver. Recipe courtesy of The 3 Foragers – discover their amazing recipes here! Sautée garlic in olive oil until softened, add diced potato and cook until lightly browned. Pour in the vegetable broth, and bring up to a boil. Turn to a simmer for 5 minutes. Add the ramps greens, dandelion greens and dandelion flowers. Simmer another 10 minutes, until the potatoes have mostly desintegrated. Season with salt and pepper. Serve with a dollop of sour cream stirred into each bowl for a super “tang”. Makes 6 servings. A special thank you to author and ecologist Corinne Duncan for her content contributions to the Dandelion Introduction. Place the dandelion flower petals in a pot and add the water, bring to a boil and reduce to a simmer. Simmer 10 minutes, then turn off heat and allow the pot to cool. Use a jelly bag or coffee filter to strain the flowers out of the water, you need 3 c. of dandelion infusion, but may have some extra. Place dandelion infusion, lemon juice, and pectin powder in a large pot. Whisk together and bring this mixture to a rolling boil. Add all of the sugar at once, stirring constantly, and return the mixture to a rolling boil. Boil 1 minute. Remove the jelly from the heat, skim the foam from the top and ladle into sterilized hot jars. Cover, and process in a water bath for 10 minutes. Makes about five 8 oz jars. Recipe by Steve Brill. Discover all of Wild Man Steve Brill’s invasive plant recipes on his site, Wildmanstevebrill.com, or download his iOS/Android app, Wild Edibles. Sauté the common dandelion leaves and garlic in the oil 10 minutes. Meanwhile, puree the remaining ingredients in a blender. Add the puree to the dandelions, bring to a boil, reduce the heat to low, cover, and simmer 10 minutes. Serves 6.